Mr. Urs: Fasten Your Stockings, Please! There is only a week left till Easter and it's about time to produce some of those Easter Eggs that even Martha Stewart made green with envy. Cut the stockings into squares. Take one and place it flat onto the table. Choose some leaves and place them nicely on the piece of stoking. Take an egg, put it onto the leaves and wrap the stocking carefully around the egg. Fasten the stocking really tight with a thread. 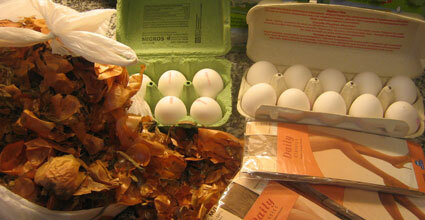 Put the onion skins and the eggs in a big pan with enough cold tap water to cover completely by 1 inch. Add a dash of vinegar. Bring to a rolling boil over high heat. 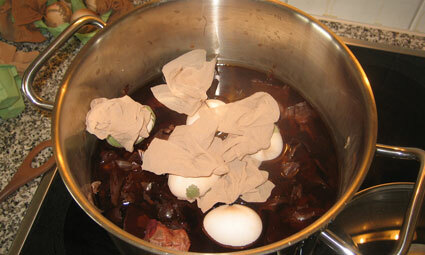 Once the water is brought to a rolling boil, promptly reduce heat to a lower medium boil and cook an additional 10 minutes for a "hard boiled" Easter Egg. Remove from heat and immediately place eggs under ice cold water or in a bowl of iced water to chill promptly to help yolks stay bright yellow. Chill for a few minutes in the cold water until the egg is completely cooled. 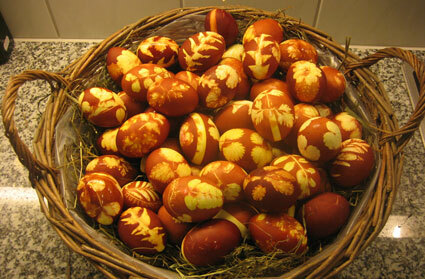 Now you can cut open the stockings and the absolutely naturally coloured eggs reveal their beauty. Enjoy them within a fortnight. If you don't shock cool them, they will stay fresh for a month but will be harder to peal. 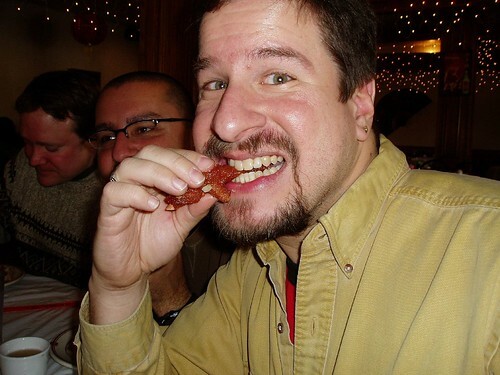 The onion skin brew can be reused several times. Just let it cool down and start again. 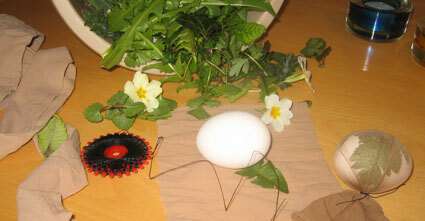 All my colleagues at work are enchanted with the beatiful Easter eggs and with elegant Easter arrangement. They deeply thank you and both us for surprising them in such a way. The Vinum manager and our Swiss Editor came personally to my office to thank us for thoughtfulness of ours. Everyone tells me, that I am real swiss and they are proud of me. You have made today many kind persons happy! These look fabulous, now if I could just find some greens around here!